The University of Illinois student from Monee accused of killing her newborn baby in a residence hall bathroom last month hid her pregnancy from friends, who were stunned to learn she’d allegedly suffocated her infant son after giving birth. 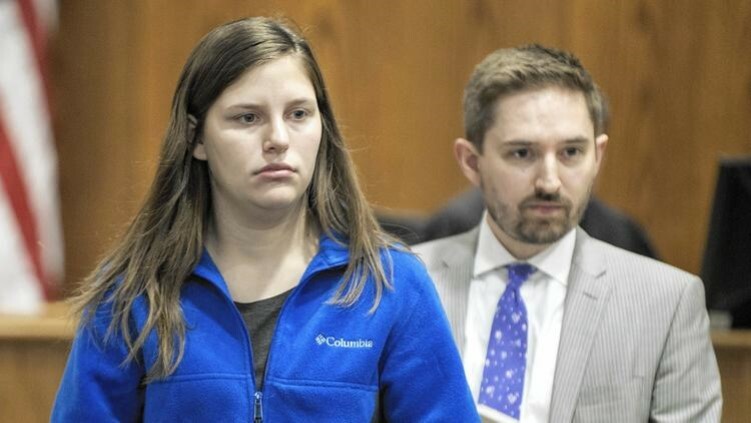 Lindsay L. Johnson, 20, an agricultural communications major and member of the university marching band, was charged with first-degree murder, child endangerment and concealment of a homicidal death this week, Champaign County and university authorities said. “It’s just very hard to recognize that this happened to a person you’ve known,” said one of Johnson’s friends, who asked not to be identified. He said Johnson appeared to have gained some weight recently, but that friends thought nothing of it because it was normal for her to dress in baggy sweatpants every day. Friends said Johnson had been spending most of her time this school year with her boyfriend, a fellow marching band member. Prosecutors allege that police found Johnson near the Urbana-Champaign campus’ music building on March 13 wearing a backpack with the deceased newborn boy inside. Officers went looking for her after responding to a call earlier in the day from another student at the dorm who reported sounds of a baby crying and that Johnson was in the bathroom for a long time. She was charged Monday and appeared in court on Tuesday. Court records indicate she was released after posting 10 percent of a $750,000 bond. Johnson and her family could not be reached for comment. Thomas Bruno, founder of the Champaign-based law firm representing Johnson, called his client a promising student with a bright future. Champaign County State’s Attorney Julia Rietz called it “an unusual case” and said she had never encountered one like it. According to the state’s attorney’s office and University of Illinois police, Johnson gave birth about 1:30 p.m. March 13 in the bathroom of her dorm suite at Bousfield Hall, 1214 S. First St. in Champaign. Police were dispatched about 5 p.m. to the dorm to check on a student who was reported to have been in the bathroom for several hours. A witness reported hearing crying and groaning sounds coming from the bathroom. When police arrived, according to the authorities, Johnson claimed she had the stomach flu and did not need further assistance. After receiving more information “from a person familiar with the situation,” police returned to Bousfield about two hours later to investigate further and found evidence that a child may have been born in the bathroom earlier in the afternoon, authorities said. Johnson left the building prior to the police arriving, and police saw blood in the bathroom. About 8 p.m., police found Johnson and transported her to the campus Public Safety Building. Johnson told police she had given birth earlier in the day. A deceased male infant was then discovered in a backpack the student had been carrying with her. According to a news release from the state’s attorney’s office, Johnson initially reported that she did not know she was pregnant until she was in the course of childbirth that day and that the child was not breathing when he was born. When confronted by the fact that the witness had heard the child crying, Johnson admitted the boy was alive when he was born and that he was crying, the state’s attorney’s office said. Johnson made statements suggesting that she may have been trying to quiet the child by putting a towel or her hand over his mouth. According to the state’s attorney’s office, Johnson admitted that she had hidden the child’s body under her bed when the police initially came to her room to check on her welfare. Forensic analysis of Johnson’s phone shows a history going back to September of searches made for information on pregnancy, pregnancy symptoms, miscarriage, home abortions, and how to manage physical signs of pregnancy after the loss of a baby, the state’s attorney’s office said. Champaign County Coroner Duane Northrup said preliminary findings from the March 15 autopsy show the baby was born alive and there was “no evidence of natural disease or natural causes” of death. Northrup said the final cause of death is pending additional tests and results. Those who know Johnson describe her as a quiet but congenial farm girl who plays the trumpet for the Marching Illini, loves country music and excels academically. Tammy Cowger, whose son Dakota was a close friend of Johnson’s at Peotone High School and who chaperoned Johnson and other Peotone High School students on Future Farmers of America field trips, said she was at a loss after reading coverage of Johnson’s arrest. Lulu Rodriguez, director of the agricultural communications program at the University of Illinois and one of Johnson’s freshman professors, recalled her former student as diligent and conscientious, with a strong interest in designing agriculture publications. “We’re a small family over here, so it really is very painful for us to see this happening,” Rodriguez said. If convicted, Johnson faces a sentence of up to 75 years, according to the state’s attorney’s office. No one else has been charged.